"I welcome all the initiatives that will facilitate the consolidation of the Georgian diaspora, support Georgia at the global arena, progress and development of our country" stated Giorgi Kvirikashvili, Prime Minister of Georgia at the Forum titled as Strong Diaspora for United Georgia, dedicated to the Diaspora Day. Prime Minister noted that Ministry of Foreign Affairs of Georgia makes rather interesting steps forward to empower the Georgian Diasporas, because success of the individual diaspora members is the success of our homeland. 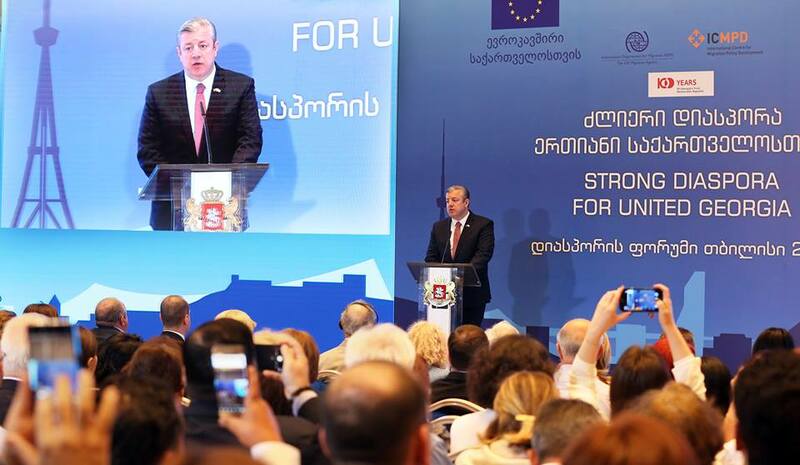 At the beginning of his Address, Prime Minister congratulated the forum participants, especially the descendants of the founders of the First Democratic Republic with the 100th Anniversary of the First Democratic Republic of Georgia and recalled the statement of Dimitris Avramopoulos, European Commissioner on Migration, Home Affairs and Citizenship. When Georgia reached visa liberalization with the European Union and when our first visit was made initially to the cultural capital of Europe - Athens and then to the political capital - Brussels together with Georgian students and youth, Embassy of Georgia held a reception that evening in Brussels and I remember a great friend of Georgia, European Commissioner for Migration, Home Affairs and Citizenship Dimitris Avramopoulos, saying the following: "Georgia would have been among the founding fathers of the European Union by all means, had soviet occupation not occurred". This statement is indeed significant. Events celebrated yesterday once again presented the importance of European, democratic traditions and history of Georgia to the entire world. We need to talk more about it. We need to talk more than we did previously about the titanic work performed during 1918-1921. I think it is very important for Georgia. If you wish, it is an acknowledgement from my side that greater significance should be given to this very important 3 year span of our history. I want to once again congratulate you with this most prominent date - 100th Anniversary - and wish Georgia to become a fully-fledged member of the European family as dreamt by the founding fathers of the First Democratic Republic of Georgia on 26th May 1918" - concluded the Prime Minister. While addressing the audience, Head of the Government of Georgia stressed the role of Diasporas in the development of the country and noted that authorities try hard to maintain close relationship with compatriots, who left their motherland at different times and for different reasons to live all over the world. Authorities facilitate their active engagement in the current developments of Georgia. In the opinion of Giorgi Kvirikashvili, addition of an absolutely outstanding provision to the Constitution is a clear evidence of this, as it raises the topic of Diasporas to the highest legislative level. "First time ever in the history of Georgian constitutionalism - in 2018 - a provision was added to the Constitution of Georgia, whereby the state assumes commitment to care about the maintenance and development of links between the compatriots living overseas and their homeland. It once again demonstrates the special attitude which the Georgian state has towards its compatriots. We keep constant contact with our large diaspora organizations. State cares about them maintaining the mother tongue and national identity. At the same time, our principle aim is to turn Georgia into a country, which will give all of us and our compatriots every opportunity of self-realization through talent and knowledge. I wish you to know that our door is always open to all of you" - said the Prime Minister to the representatives of the Georgian diaspora. Giorgi Kvirikashvili also spoke about the programs, which are implemented and successfully performing in Georgia towards relationship with the diaspora. "One of such programs is the Camp for Future, which aims to strengthen the link between the Georgian youth living overseas with their historic homeland. Also, Young Ambassadors Program is implemented in 16 countries of the world, which engages the socially active adolescents dwelling overseas. This is one of the most important means of public diplomacy and it also facilitates the foreign promotion of Georgia. We believe that maintenance and study of the native language has a tremendous importance for the diaspora and we do our best to support them in this endeavor. In several countries, e.g. in Turkey and Greece, Georgian language is taught at public schools; relevant textbooks are published; common curriculum is developed first time ever for Sunday schooling; integrated textbooks are in the pipeline. Scientific research support project in reference with Diasporas will be implemented this year, which aims to increase the qualitative information on the topic and to introduce innovative solutions to the current problems. Also, Special Program is being developed for the Management of Diaspora Organizations to further increase the effectiveness of their operation" stated the Prime Minister. Head of Government expressed hopes that relationship established between the State and Georgian Diasporas, will bring tangible results to Georgia and every representative of the Diaspora, as each successful Georgian is our pride and joy. President, Chairman of the Parliament, Vice Prime Minister and Minister of Foreign Affairs of Georgia also addressed the participants of the forum dedicated to the Diaspora Day, along with Rejeb Zhordania, son of the Chairman of the Government of the First Democratic Republic of Georgia.